For the amount of crazy stuff that Portland has to offer, it should be a mad city hyped up on all the sweets and sugar from Voodoo Doughnuts; sleep deprived from their Stumptown Coffee, while being forever lost in their imagination from the thousands and thousands of books at Powell's Bookstore. But Portland is not a mad city. It is actually a very fun city made up of very friendly people. Not to mention Portland's food culture is out of this world not discriminating between food trucks and brick and molder establishments. Every place that I ate was fantastic (now I know why they legalized dispensaries 0_0). Okay, that's enough weirdness for one post. Continue to read my Portland Travel Guide below to find out the Best Time to Visit Portland, Renting a Car, Where To Stay, Food & Drink, Things To Do & See, and most importantly the Best Photography Spots in Portland. 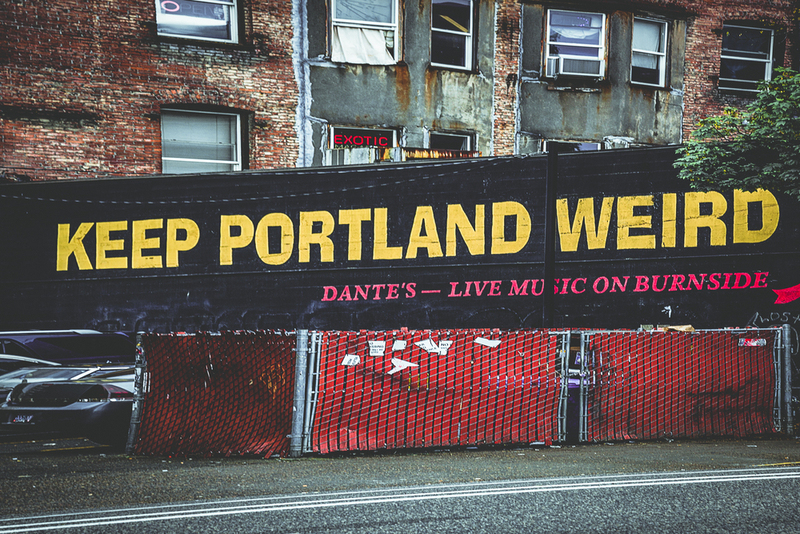 I hope you can use this travel guide to keep Portland weird as you explore to this great city! Portland has all the seasons and each season offers its own uniqueness. Depending on your interest, the best time to visit Portland is really up to you. Below you can find an overview of the weather for every season. Spring is a beautiful time to visit Portland as all the flowers and trees are blooming, weather is warming up (with some rain), and it is not crowded. You will be able to see Portland Rose Festival from May to June. If you love the outdoors, and don't mind the tourist crowds, summer is the best time to visit as the weather is warm, days are long, and the roses are in full bloom. There's also Oregon Brewers Festival in July, and The Bite of Oregon in August. If you rather be inside enjoying some food, art, coffee, and a good book to read, come during the Fall. Portland will have rainy weather, perfect for indoor activities (especially for Powell's Bookstore). Winter is the cheapest time to visit Portland as it is the raining season. This is ideal for any winter sports enthusiast as Mt. Hood provides the perfect place to ski and snowboard. There's still so much to enjoy in the city with festivals like the Portland Winter Light Festival. The best area to stay is in the Northwest District. Within this area, find a place in The Pearl District or Nob Hill (or Alphabet District) area. They are both close to downtown with tons of restaurants and tourist activities nearby. The public transportation streetcar also travels through these areas. This hybrid hotel provides a accommodation for everyone, as it doubles as a hotel and hostel. Very clean and friendly staff. Great place for solo or group travelers. A cheaper route that will give you a true Portland experience. If you're lucky, your host might be able to tell you the best local spots or even show you around. For the more luxurious experience, Hotel Monaco is located in the middle of downtown Portland. It is close to great restaurants, sightseeing activities, and public transportation and also has a cozy lobby with a fireplace. A boutique hotel located next to Burnside with Voodoo Doughnuts, food carts, and Stumptown coffee within walking distance. For a tighter budget, consider this recently re-modeled Best Western. About a 10-15 minute drive from the city center and provides free airport service, free breakfast, and is a 5 minute walk to Wal-Mart. Getting around in the city of Portland is a piece of cake. Public transportation is prompt, clean, and safe. Ubers & Lyfts are readily available and renting a car in Portland to visit Multnomah Falls is easy and cheap. In order to get to Multnomah Falls and to the Wooden Shoe Tulip Festival, you'll need a car as it is about a 45 minute drive to each place (90 minutes total). Renting a car seems like a daunting task, but trust me, it was super easy. I rented through Kayak and found Alamo. I scheduled my pick up for 9:00AM and drop-off at 6:00PM (these times don't matter as "all day" really means all day). Included with this was free cancelation from Kayak. I didn't buy insurance since I'm covered by using my Chase Sapphire Card. The total cost including all fees was $21.43 for the whole day (cheaper than some of our uber rides). After visiting Multnomah Falls and the Wooden Shoe Tulip Festival, I'd ditch the car. Within Portland, I'd recommend using a riding sharing app. There's plenty of drivers so you don't have to wait long, and it is also a great way to meet locals and ask them for recommendations. I actually found most of my food recommendations and photography spots from my uber drivers. You really don't need a rental car within the city of Portland, especially in a town filled with 52 breweries. Be safe and use a ride sharing app when visiting the breweries. The streetcars in Portland are inexpensive and easy to use. They are clean and prompt and your purchased tickets can be used for the streetcars as well as the busses. You really can't go wrong when choosing a place to eat or drink in Portland. There's a ton of restaurants and everything is just so good. Since there's so many, I'll just give a brief descriptions and highlights. Deschutes Brewery (Food & Beer) - Great beer with great food. Try the spicy chicken waffle. Pine State Biscuits (Breakfast) - A MUST GO! Big portions & great biscuits. Lines can get long but it is worth it. Mother's Bistro & Bar (Breakfast) - Have a drink for breakfast, or ice cream with that waffle. Stumptown Coffee Roasters (Drink) - One of the best coffees in town. Verdigris (Dinner) - American, French, Italian with bread to die for. 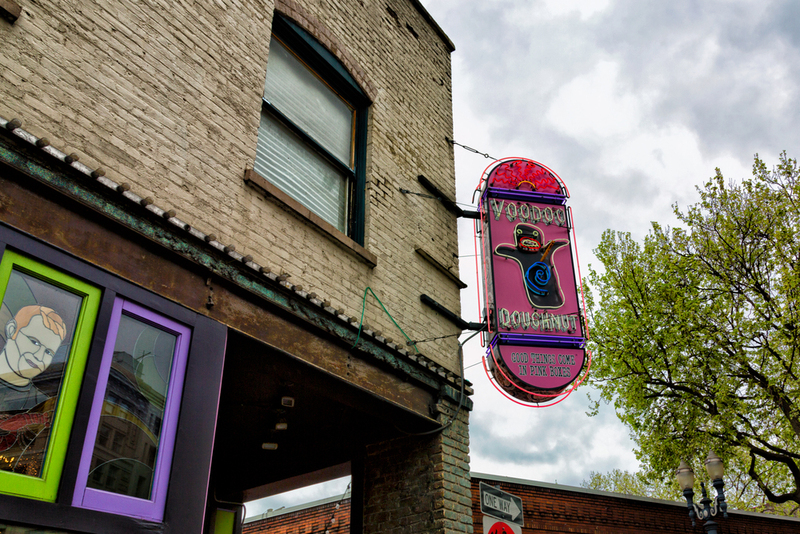 Voodoo Doughnuts (Dessert) - Crazy toppings on a doughnut like captain crunch or Oreo and peanut butter. Line is usually long, but goes by quickly. Tidbit Food Farm and Garden (Food Trucks) - So many choices!! The Korean Hawaiian pineapple fried rice is yummy! Portland City Grill (Food & Beer, Happy Hour) - Located on the 30th floor, Portland City Grill is great for happy hour looking over the city. Cascade Brewing Barrel House (Food & Beer) - Want to try sour beer? Come here. Pok Pok (Food) - Locals call it the most popular Asian place in Portland. Henry’s 12th Street Tavern (Food & Beer) - Can't make it to all 51 breweries. Come here if you want a sample of each. You would think the majority of tourist activities is food and breweries, but Portland still has other activities that doesn't require eating or drinking. Pittock Mansion - See the mansion on the top of the hill with a view of the city. Washington Park - Encompasses the Oregon Zoo, Rose Garden, Children Museum, and Japanese Garden. Lan Su Chinese Garden - A beautiful, serene garden. Portland Japanese Garden - One of the largest Japanese Gardens in the U.S.
Portland Saturday Market - And Sundays too! Portland's outdoors arts & crafts market that also serves food & drink. Powell's Bookstore - A giant bookstore filled with tons of books, a cafe, and much more. Multnomah Falls - Portland's iconic bridge and waterfall. Wooden Shoe Tulip Farm - See rows of tulips, ride in a hot air balloon, and grab some shaved ice. Hawthorne Street - Lots of vintage shops, restaurants and street musicians. Save the best for last! In Portland, you can capture a heathy mix of cityscape and nature photography all in ever changing seasons. The possibilities are endless! Counsel Crest - Beautiful landscape shoot of Mt. Hood. Eastern Side Of Hawthorne Bridge (south most bridge) - Capture the draw bridge with the city lights illuminating the background. 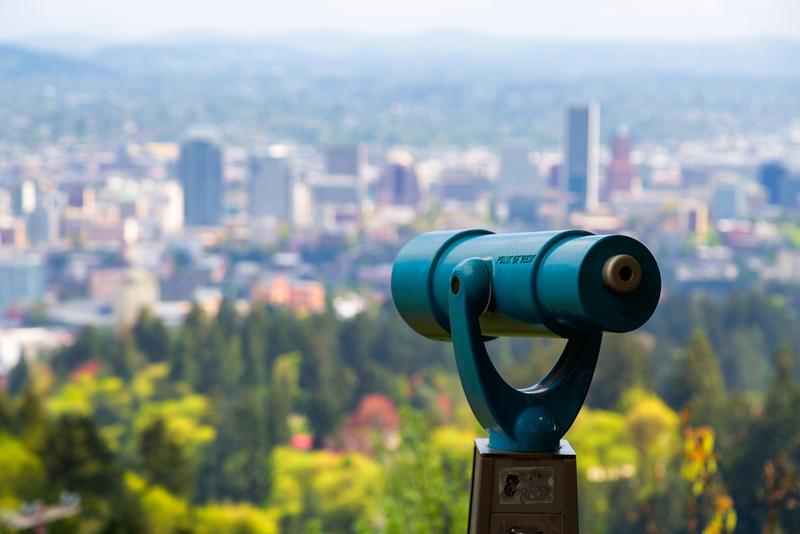 Pittock Mansion - Situated on top of a hill, this mansion has a cityscape view. Trillium Lake - A beautiful reflection shot of Mt. Hood . International Rose Test Garden - The best place to capture roses! Lan Su Chinese Garden & Portland Japanese Garden - Capture the beauty of each garden. White Stag Sign - The neon sign that welcomes visitors. Prior to visiting Seoul, Korea, I had no idea what this trip was going to consist of. And I'm glad I have no expectations. I met up with a good friend who grew up in Seoul and he showed me everything. I'm not just talking about the touristy spots like the famous Gangnam District, N Seoul Tower, or Korean BBQ. I'm talking about delicious KFC (Korean Fried Chicken), speakeasy bars where you have to enter through a window, silent disco parties, and much more. Visiting Seoul was a pleasant surprise and in this Seoul Travel Guide, I'm going to be covering the Best Time to Visit Seoul, Where To Stay, Transportation, Food & Drink, & Photography Spots In Seoul.